Oh how much fun my family and I would have when we visited the beach. It could be some sandy stretch along the Atlantic Ocean, a pristine lake at a park or a small pool tucked along a mountain stream. Water temperatures varied greatly between locations but getting wet and having fun made the blue lips worth it. 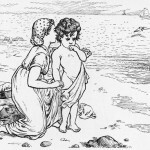 This section of Reusable Art shares a myriad of vintage images of children at the beach. Some are brightly colored like a kaleidoscope and others are simple shades of black and white. All of these beach scenes are in the public domain. That means they could be safely used in all of your craft projects. 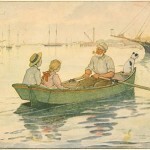 A pair of children and their dog spend a day sailing with grandpa. Their small rowboat navigates between sailing ships at anchor in a harbor. 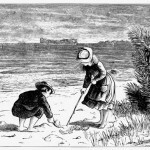 Vintage line drawing of two children building sandcastles on the beach with their dog. A parent or grandparent sits nearby on the dunes watching over them. 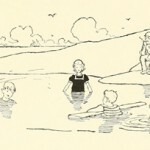 Vintage drawing of children having fun in their favorite watering hole. 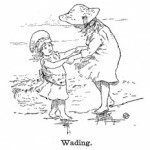 Drawing of two children playing with a pair of dolls riding in a sailboat. 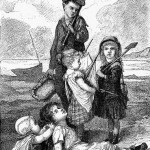 Vintage drawing of a group of siblings at the beach. 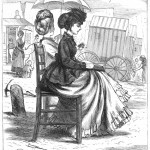 Wonderful vintage drawing of a child reluctant to go in the water. 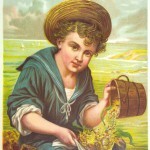 Beautiful color plate of a child on a golden beach. 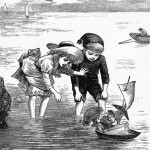 A pair of children comb the beach for shells and other treasures. Drawing of a family at the beach. 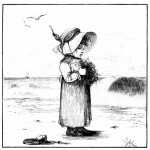 A young girl examines a bunch of seaweed in this vintage black and white drawing. 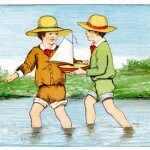 Two young boys with their pants rolled up wade in the water waiting to launch their toy sailboat. Going sailing is a public domain illustration from 1881. Two children wade in the surf.